Phytoplankton primary production usually is measured by gas exchange or 14C uptake in light and dark bottles, although how well conditions inside bottles represent the conditions of turbulence, light, and herbivory experienced by phytoplankton in rivers is a concern (Reynolds and Descy 1996). Very low phyto-plankton production was recorded in the Orinoco River (4-43 mg C m 2 day1), as expected due to unfavorable environmental conditions of turbidity, depth, and swift current (Lewis 1988). Greater production has been recorded under impoundment conditions (Prowse and Talling 1958), and nuisance levels of phytoplankton have been reported under conditions of high nutrient loading (Bennett et al. 1986) and low flows (Décamps et al. 1984). Descy et al. (1988) reported a range of 0.6-1.68 g C m 2 day1 for mean annual GPP for European Rivers. Zooplankton grazing does not appear to constitute a major loss term for phytoplankton under most conditions (Reynolds and Descy 1996). Compared to lakes, rivers typically support a zooplankton biomass less than would be expected based on the amount of phytoplankton (Pace et al. 1992). In the Danube (Bothar 1987), the Apure (a whitewater tributary of the Orinoco, Saunders and Lewis 1988), and the Hudson (Pace et al. 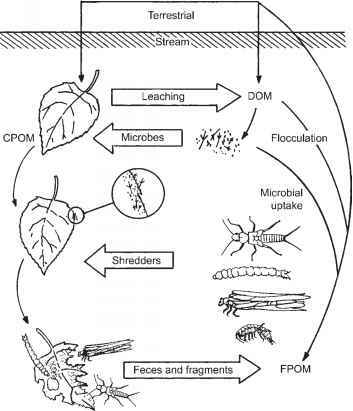 1992), zooplankton grazing was believed to have little impact on phytoplankton. The largest species of microcrustaceans, which are capable of the highest filtering rates, are uncommon in rivers because their slow rates of population growth do not compensate for downstream transit. Rotifers and smaller crustaceans usually predominate because of their shorter generation times, and even these taxa can increase their numbers only during low flow periods. For example, Rzoska et al. (1952) reported transit times at moderate flows to be twofold to threefold longer in the White Nile compared to the Blue Nile. Crustacean zooplankton predominated in the former, while the Blue Nile contained mainly rotifers. Thus discharge conditions determine the species and size composition of zooplankton, and thereby constrain their ability to exert strong grazing pressure. Nonetheless, grazing does consume significant amounts of phytoplankton production under some circumstances. In the fresh, tidal Potomac River in Maryland-Virginia, phytoplankton abundance was reduced 40-60% upon passage through a section of high densities of the Asiatic clam Corbicula fluminea. The filtering rates of these clams could reduce chlorophyll a from a river water sample by 30% in 2 h (Cohen et al. 1984). The zebra mussel Dreissena polymorpha, which first appeared in the Hudson River in 1991, quickly became so abundant that their populations were capable of filtering the entire volume of the Hudson estuary every 1-4 days during summer. Phytoplankton biomass fell by 85% due to direct consumption (Caraco et al. 1997), and the entire ecosystem was affected through associated changes in nutrients, water clarity, other grazers, and due to increases in submersed macrophytes (Strayer et al. 1999). Both examples involve invasive bivalves, and illustrate the potential for nonnative species to dramatically influence ecosystems. Because low grazing rates are the norm, however, under most circumstances the majority of the primary production of rivers is exported downstream.